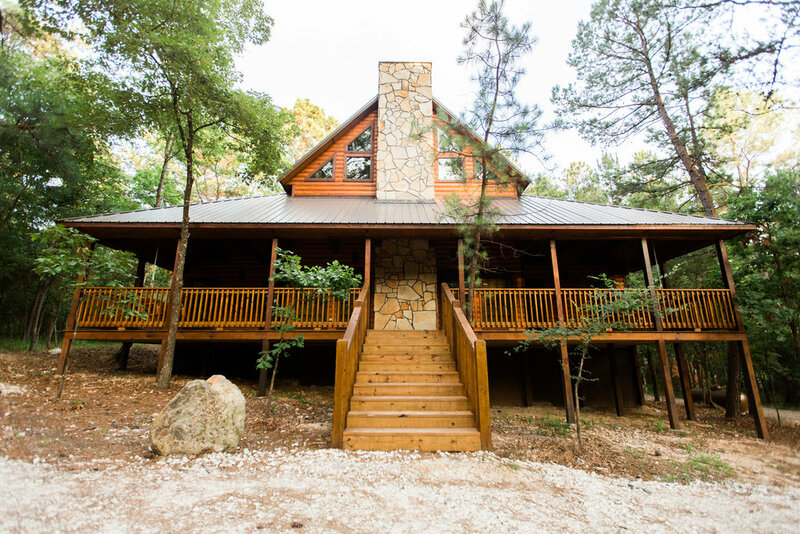 Runnin' Moon is a new, spacious cabin in the Lakewood Estates development just across the highway from the entrance to Broken Bow Lake and Beavers Bend State Park. 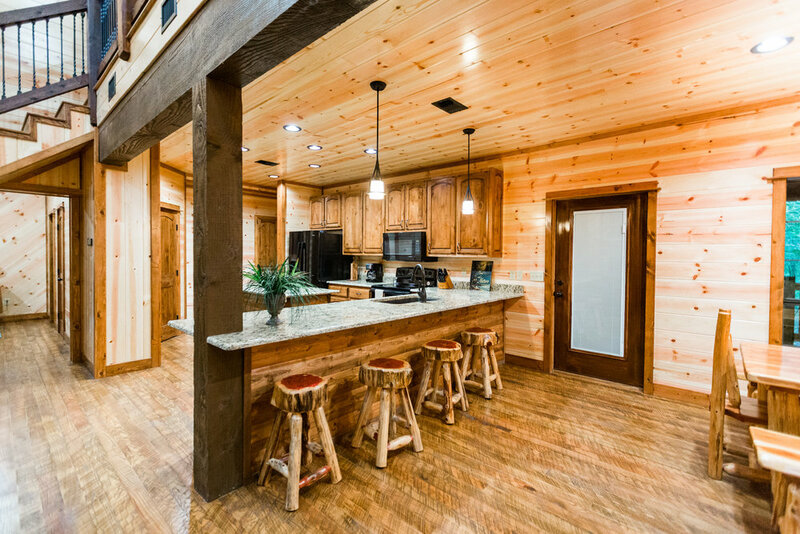 This 2,200 sq ft cabin features an open floor plan with plenty of room for your entire family. The living area is open to the spacious kitchen and dining area. It features a 2-story gorgeous rock gas-log fire place with a large flat screen television. The front and back decks are both covered providing plenty of space to enjoy the towering pines surrounding the cabin. The master suite features a king bed and a private bathroom with both a shower and a large soaking tub. The second downstairs king suite has a combination tub/shower unit and the third queen bedroom has a full tub/shower bath adjacent to the bedroom. Upstairs in the loft you can enjoy an evening of game time with the foosball table and a large shuffleboard. The kids will also enjoy the PS4 gaming system in the loft. And, kids or adults can get a great night's sleep in the double queen bunks. The kitchen is stocked with everything needed to prepare a wonderful meal with friends and family. 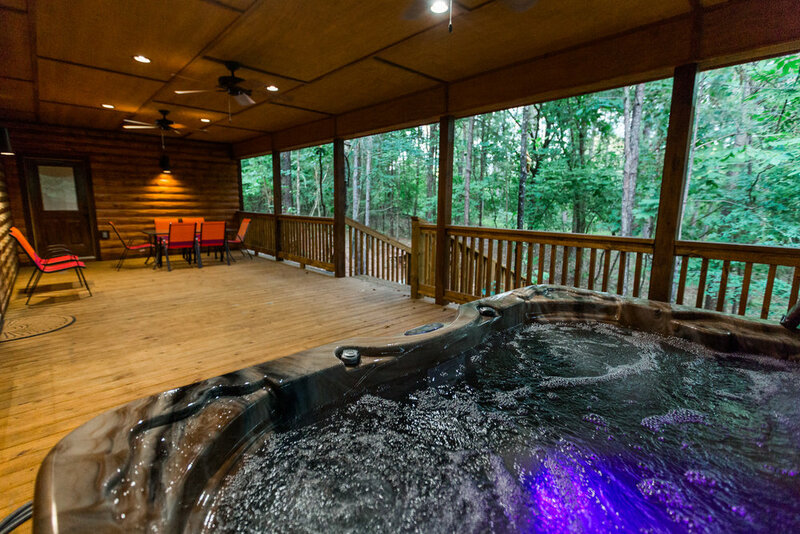 After a day exploring all the nearby attractions, you and your friends can relax in the 6-person Hot Tub on the covered back porch. Then, enjoy the outside fire ring with firewood provided. .